Children are usually the promise of a brighter future in a country. But in North Korea the ruthless propaganda machine educates the children to believe in the country’s ideology and philosophy. Under the national ‘uniformity in thinking’ policy, the state guarantees that citizens’ minds are programmed from the very beginning of their existence. Since they are very small, they are told to believe that foreigners are evil, people who surrendered to a very degraded life which is a threat to the stability of the regime. They are told how great their country is in the world, describing misleading stories invented for the occasion. Children may know that they are comparatively poor, but at least there is a magnificent country leader that takes care of them. 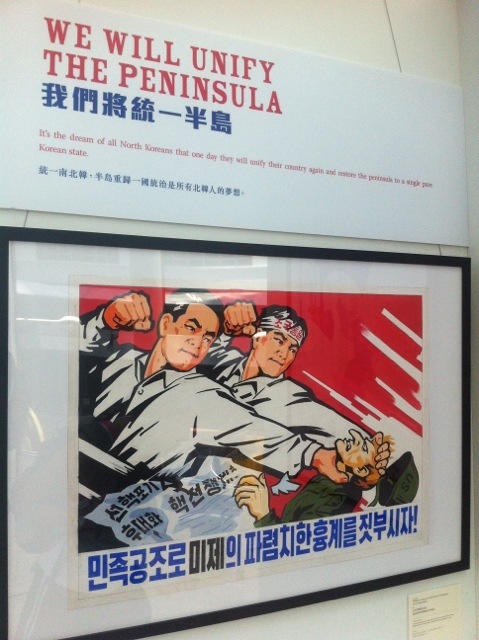 They are told that North Korea holds the purest values of a unified Korea, that the government is building a paradise for the future and that the military structure is the most important thing to protect their future. And they are born in a very hierarchical society, that locks them into strict layers, depending on the history of their family. Upper layers are great leaders’ descendants and top officials, then businessmen and so on, as long as they stay loyal to the regime’s capricious commands. Children of former prisoners of war, defectors, or anybody suspicious to be disloyal are born doomed to be the worst of the society. 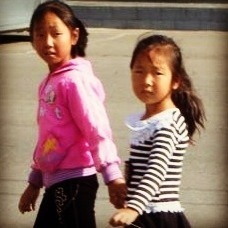 I haven’t seen children in any other part of the world that look scared when tourists wave at them with a smile. The ones we saw only waved back when they were later instructed by the tourist guide, instead of giving us an spontaneous smile. Visiting a kindergarten we could sadly realize that the propaganda fully succeed on its evil goal of controlling the population. 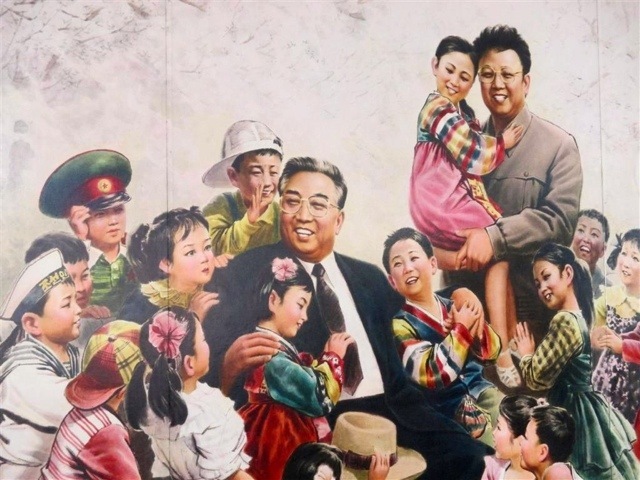 Children seem to be carefully educated on the love to the great leader, the hate to the enemies and the military power as the way to keep a better future. 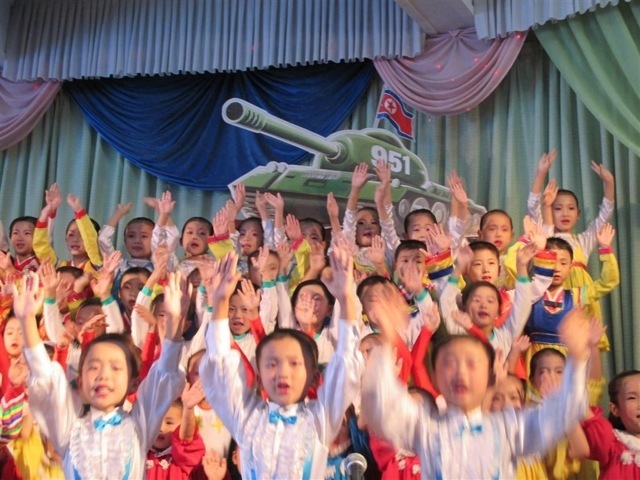 The kindergarden seemed like a factory where the totalitarian regime builds patriotic minds, correct and obedient automats, soldier children moulded to adore the great leader. We attended a show where the children were displaying their skills at singing, dancing, juggling, etc. However, staring at all that display, I could only focus on the violence related signs carried by this group of innocent kids, and the subliminal messages they were forced to deliver. They would finally believe those after repetition, after relentless indoctrination, in a country hermetically sealed to keep out anything that may question the great leader’s divinity. Disheartening view for any pacifist. I really wish these kids will be raised in Joseon, a unified and peaceful Korea, and they can grow up capable of understanding the world around them, without any fake God planting anything in their young and innocent minds.